If you are ever asked to review a book about cupcakes, say yes, because there's only one proper way to review a book of this sort and it's yummy. 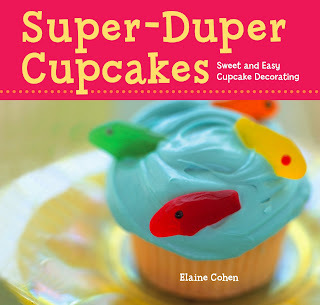 Super-Duper Cupcakes: Sweet and Easy Cupcake Decorating by Elaine Cohen is a new book from Sterling Children's Books that brings cupcakes back down to basics for kids. This book has only two cupcake recipes -- Deep Dark Chocolate and Vanilla Heaven. 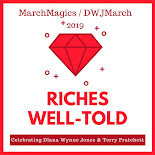 And, thankfully, it also says that it's perfectly acceptable to use store-bought cake mix or even to buy pre-made cupcakes and just decorate them yourself. For an overwhelmed parent, this takes away a bit of guilt during a busy week. Z chose the chocolate recipe and helped me make the batter. It was really easy and came out super light and airy. The cupcakes baked up perfectly though, as usual, I overfilled the cups. I just can't ever seem to stick to 80 percent! Once they cooled, we used a store-bought frosting (Duncan Hines Frosting Creations -- mint chocolate flavor) and then gathered together some leftover Easter candy (yes ... leftovers before Easter because they were actually our pre-Easter candies ... don't judge) and started decorating! The book has lots of great themes--animals, vehicles, holidays--but we went (mostly) with flowers. I also tried the technique of putting a cookie cutter on the top to make a shape from sprinkles (or in this case, Nerds). Sadly, I had to use a circular biscuit cutter because apparently I only have Christmas cookie cutters. I'm going to have to remedy that sometime before next spring. Anyway, this book was easy to use and Z loved just looking at it and dreaming of cupcakes. The cupcake recipe was wonderful, making fluffy cupcakes with a rich chocolate flavor. I will definitely try the vanilla recipe next time. If you're starting to bake with your children and are overwhelmed by some of the other options out there (which are gorgeous but probably out of reach for the average home baker), give this one a try! This sounds like such a fun book! I think my little guy would like it too. It's a great book to get kids baking! I don't make them very often either. I'm not a huge cake person but these were tasty (and Z appreciated finally having some cupcakes around)!